Words of Positive Affirmation Collaboration Poster | Testing Motivation! 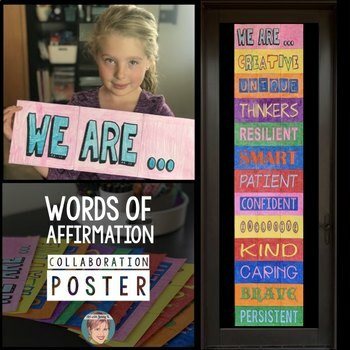 This collaborative poster project is so much fun because not only does it involve the participation of everyone in the classroom, but also that in the end, you will have a very large, eye-catching poster that you can display in your classroom, on a bulletin board, door, or hallway to provide inspiration and motivation to your students! 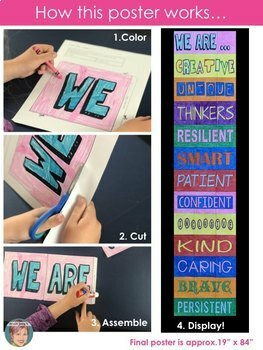 The collaborative poster reads, "We are... creative, unique, thinkers, resilient, smart, patient, confident, inclusive, kind, caring, brave and persistent." The message in the poster stands all on it’s own, but could be really great around testing time to encourage your students. It also would work great to cover up content on your classroom walls (so you don’t have to remove them during testing) with words of positive affirmation! No matter what time of the year--it's a great project for your class! There are 39 total pages in this collaborative poster. The final poster is approximately 19” wide and 84” (7 feet) tall. If you need the poster to be smaller I have provided instructions on how to do that (in the resource). There are 12 words of affirmation - each word is created from three pieces of paper. These words are creative, unique, thinkers, resilient, smart, patient, confident, inclusive, kind, caring, brave, and persistent. 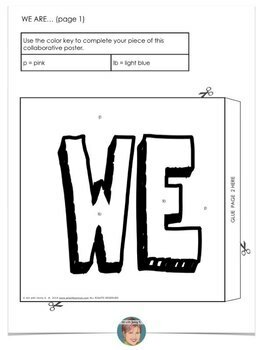 There is also a title, “We are…” which also fits on three pieces of paper. There are so many ways you can display the final poster. 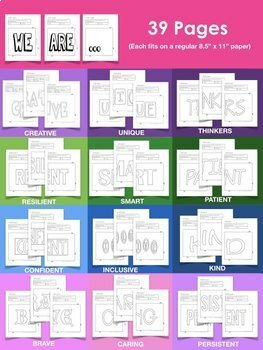 You could hang the pieces on a bulletin board, down a hallway, or on your classroom door - just to name a few (see the preview for examples). All the instructions you need for this project (including ways to assemble the poster). Options for how you can print the poster and ways you can make it unique. Finished examples, in case you’d like to project them on your white board for students to see finished versions as they work on theirs. However, many teachers like to keep the final result a surprise while students are coloring so their students don't quite know what they are making until the end...it’s really exciting for them this way! Help me keep the price low by purchasing additional licenses for any teacher you would like to share this lesson with. Extra licenses are discounted. Purchase extra licenses for others to use this resource at a discounted price.